Hello, lovelies~ I'm blogging from my mobile phone. Just trying out the app to see how it works. 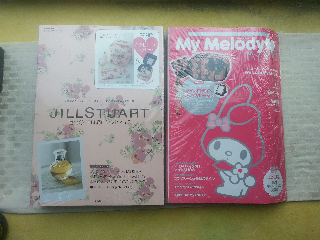 Yesterday, I went Kinokuniya over at Taka and bought the Jill Stuart and My Melody Mooks. They resemble the look of a magazine, but is usually related to one specific brand. There are other mooks auch as Anna Sui, Kitson, etc. Inside the Mook, there are products exclusive to that brand. are those books great to read ?